Double edge nut files featuring popular electric guitar gauges specially designed for slotting nuts. 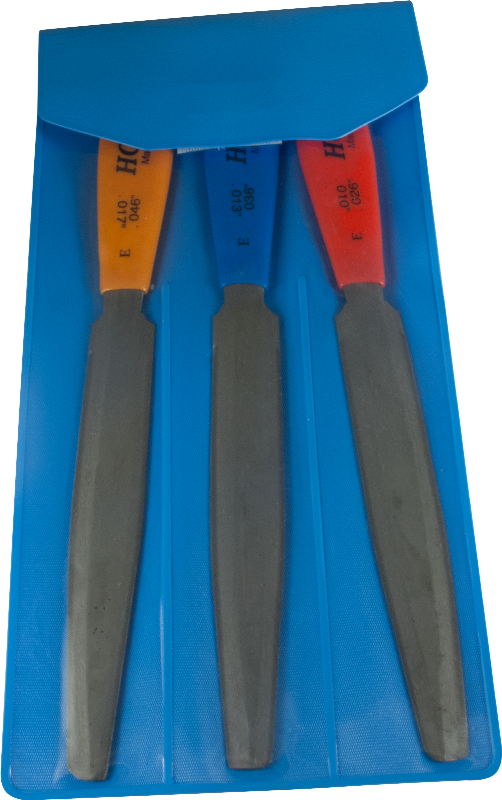 This set of three files will cover the work of six and cuts a smooth round bottom slot. 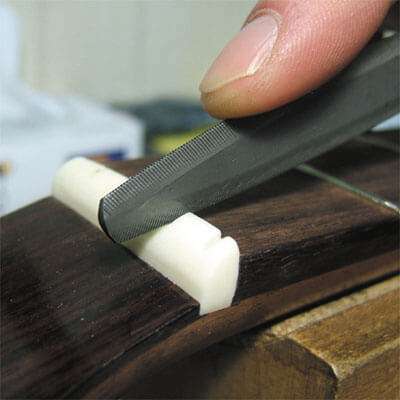 Always try and use a file gauge that’s not more than a couple thousandths larger than the gauge of string you are using. Smaller files can be used to create wider slots by using a side-to-side movement while cutting. 6 gauges: .010"/ .026-.013"/ .036"-.017"/ .046"
Packaging Dimensions 7.875 in. x 3.82 in. x 0.35 in. 2 answers are these the Vshape cut or round cut? The files are slightly rounded. Great Nut Files... They worked just fine... Go slow and they will do the job !